All members are entitled to one free E-Blast per year. Additional E-blasts are $75 for members. Non-members pay $100 per E-Blast and are only allowed one per year. All E-Blasts must be approved by our Marketing department prior to sending out. Email marketing is a direct marketing strategy used by many Board of Trade’s and Chamber of Commerce. It is very similar to the days when flyers were mailed directly to your home. 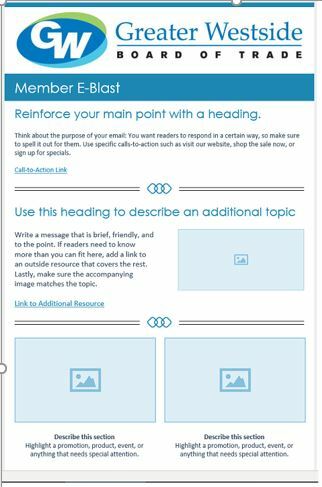 E-Blasts give members the chance to keep in touch with other members and people interested in local businesses. Members can introduce their brands to new customers quickly, easily and at a minimal cost. An e-blast is the same as sending a standard email to a large distribution list at one time. They are an effective way to communicate with potential customers and fellow members and they drive sales. To make your E-Blast even more effective ensure that you have a compelling call to action (CTA). Prior to sending us your E-Blast to be posted, please read up on CTAs. All pictures must be in a .jpeg format. Posters must also be in a .jpeg format. Let the marketing department know what day you would like the E-Blast sent out and what time. Also contact the marketing department at 250-768-3378 if you require a preview. Buy Now: Don’t wait, starting saving money today! “Image Size” refers to the dimensions of your image – the image height and width. Constant Contact compresses any image that is over 800 pixels wide, and the image’s height is reduced proportionally. This causes the image to lose quality – leading to grainy, fuzzy, or blurry images. If an image’s height is greater than its width, then it will be compressed to 1278 pixels. Most Constant Contact templates are about 600 pixels wide, so we recommend keeping the width of your images to no more than 600-650 pixels. Keep in mind that the 600 pixel recommendation is for an image that spans the width of the email. Check out the table below for recommendations on sizing images for a multi-column layout. *There usually isn’t an ideal height because each block will adjust to fit the image’s height. However, keep in mind that very large images may cause scrolling and some clients, like Outlook, may crop images that are more than 1728 pixels in height. Not sure what dimension or file size your image has? Find out here. “Resolution” refers to the number of pixels in an image. When you create an image, certain image editing programs allow you to set the resolution. What is the recommended resolution for my image? Whenever possible, we recommend that you save the original design file with a resolution of 72PPI (pixels per inch). This will minimize image compression when you bring the image into the Constant Contact Library. Image size for the web is described in pixels, while images for print media are designed in dots per inch (DPI). Check your computer’s DPI settings, as they can cause image distortion when viewing in certain desktop clients. While “Image Size” is the height and width of the image, “File Size” is the amount of storage space your image will occupy. Factors like image size and compression will contribute to the file size of your image. What is the recommended file size for my image? If your image editor has an option to “Save for Web & Devices” or to “Optimize” the image, choose a resolution that shrinks the image’s file size to less than 5MB. Remember to flatten any layers when you save the final image. This will help to reduce the file size. Keep in mind that larger images may also take longer to load in a subscriber’s inbox. If you are running into problems, try keeping your images under 1MB each. What is the recommended file type for my image? The Constant Contact Library doesn’t allow image files in TIFF or BMP format, but you can use any basic image editing program to save them as a PNG, GIF, or JPG.